Objective To examine the quality of tobacco industry-funded data on the illicit tobacco trade (ITT) through a systematic review of existing assessments of industry-funded data on ITT. Data sources Papers and reports assessing tobacco industry-funded data on ITT were obtained via searches of 8 academic databases, Google searches and correspondence with ITT experts. Study selection Inclusion criteria identified 35 English-language papers containing an original assessment of tobacco industry-funded data. Data extraction Using a coding framework, information was extracted from the assessments regarding the quality of tobacco industry data. Documents were second-coded, achieving 94% intercoder reliability with all disagreements resolved. Data synthesis Of the 35 assessments reviewed, 31 argued that tobacco industry estimates were higher than independent estimates. Criticisms identified problems with data collection (29), analytical methods (22) and presentation of results (21), which resulted in inflated ITT estimates or data on ITT that were presented in a misleading manner. Lack of transparency from data collection right through to presentation of findings was a key issue with insufficient information to allow replication of the findings frequently cited. Conclusions Tobacco industry data on ITT are not reliable. At present, the tobacco industry continues to fund and disseminate ITT research through initiatives such as PMI IMPACT. If industry data on ITT cannot meet the standards of accuracy and transparency set by high-quality research publications, a solution may be to tax tobacco companies and administer the resulting funds to experts, independent of the tobacco industry, who use previously developed reliable models for measuring ITT. Tobacco company product that was en route to, imported into, distributed in or sold in a jurisdiction in violation of the applicable fiscal laws of that jurisdiction,46 for example, tobacco industry product present in the illicit market. The fact that this product was manufactured by the TTCs does not imply they are always responsible when that product ends up on the illicit market. As a consequence of TTCs' use of self-funded data, a growing number of independent studies have scrutinised the quality of these data in Australia,45 Europe,46 Asia47 and South Africa,48 levelling a number of criticisms against them.31 46 To date, there has been no attempt to systematically summarise this literature. Undertaking these assessments is expensive, time consuming and difficult to achieve quickly enough to be useful within the rapidly moving policy cycle. This paper therefore aims to systematically review existing studies, which assess tobacco industry data on ITT (hereafter ‘assessments’) to provide a substantive overview of the characteristics of such data and to identify the nature of critiques of tobacco industry data/reports on ITT. By compiling this information, this review will aid public health responses to any future data on this topic. Growing tobacco industry funding of research on ITT underlines the importance of such work. Philip Morris International’s (PMI) latest initiative, PMI IMPACT, has pledged US$100 million to fund research on illegal trade and related crimes and, as of early 2017, had committed US$28 million to 32 projects across the European Union (EU).49 50 Outlining the findings of existing assessments of past data funded by the tobacco industry is a useful and necessary step towards better understanding future data and how to respond to it. (("Philip Morris" OR "PMI" OR "British American Tobacco" OR "BAT" OR "Imperial Tobacco" OR "Imperial Brands" OR "Imperial" OR "ITG" OR "Japan Tobacco" OR "JTI" OR "Tobacco company" OR ‘"transnational tobacco company" OR "TTC" OR "TTCs") AND ("research" OR "evidence" OR data* OR "study" OR "studies" OR report*) AND (illicit* OR illegal* OR smuggl* OR "contraband" OR counterfeit*) AND ("tobacco" OR cigar*)). Minor variations were made in order to identify the most effective search for each database. Additional searches were conducted in the specialist peer-reviewed journals Addiction, Health Economics and Tobacco Control to ensure that potentially relevant assessments had not been overlooked within the main database searches. Google searches were performed to identify grey literature using ‘illicit tobacco’ and the names of the aforementioned TTCs. Searches for ‘illicit tobacco’ were also performed on websites of organisations involved in tobacco industry monitoring and research on ITT. All searches were conducted between February and March 2017. In order to capture as many potentially relevant assessments as possible, results were not restricted by year of publication (see online supplementary appendix 1 for full protocol). A total of 3815 potential assessments were identified; 3720 from database searches and 95 from non-database sources. Records were stored in a reference management system (Endnote) where duplicates were removed, leaving 2690 documents. Inclusion and exclusion criteria (box 2), developed in conjunction with all authors and piloted, were then applied, leaving 56 potential assessments after title and abstract screening. The bibliographies of these 56 were then hand-searched to identify any additional literature, bringing the total of potential assessments to 60. Inclusion and exclusion criteria and key definitions. Document must be written in English. Document must include data on ITT (a key term search of the document was conducted when this could not be determined from the title or abstract). Document must not have received funding from the tobacco industry. Document must assess data on ITT that has received funding from the tobacco industry. Document must clearly identify the data that are being assessed, eg, the source of the data has to be identifiable from the contents of the document. ‘Assess’=to provide an evaluation of tobacco industry data on illicit trade. This could be a positive or negative statement regarding any element of the data such as how it was collected, analysed, presented, etc referring to or citing data without providing any critical comment on it was not considered an assessment of that data. Solely referring to pre-existing critiques of data was also not considered an assessment. ‘Industry-funded data on illicit trade’=any data on illicit tobacco that has been funded fully, or in part, by tobacco companies including industry-commissioned research and research conducted by those that receive industry funding. This includes data that transnational tobacco companies claim as their own or have commissioned, as well as data featured in a newspaper, website, public event or advertising campaign that comes from an industry source. ‘Source’=where the assessed data were taken from. Sources may include industry-commissioned reports, internal industry documents, industry press releases and media reports containing statements made by tobacco companies or their representatives. These 60 were then read in full for relevance, defined as ‘providing an original assessment of industry data on ITT and clearly identifying the source of the data’ (box 2). Tobacco control experts with an interest in ITT were then asked to review a list of assessments that had been deemed eligible after full-text review, and asked for any additional literature to include in the review and any other experts to contact. Experts identified two additional articles. A total of 35 assessments were included in the review (figure 1, online supplementary appendix 2). Study selection process—Preferred Reporting Items for Systematic Reviews and Meta-Analyses flow diagram. ITT, illicit tobacco trade. Critical appraisal of the assessments themselves was conducted, considering if they underwent a peer-review process, disclosed funding sources and outlined their methodological approach (see online supplementary appendix 3). 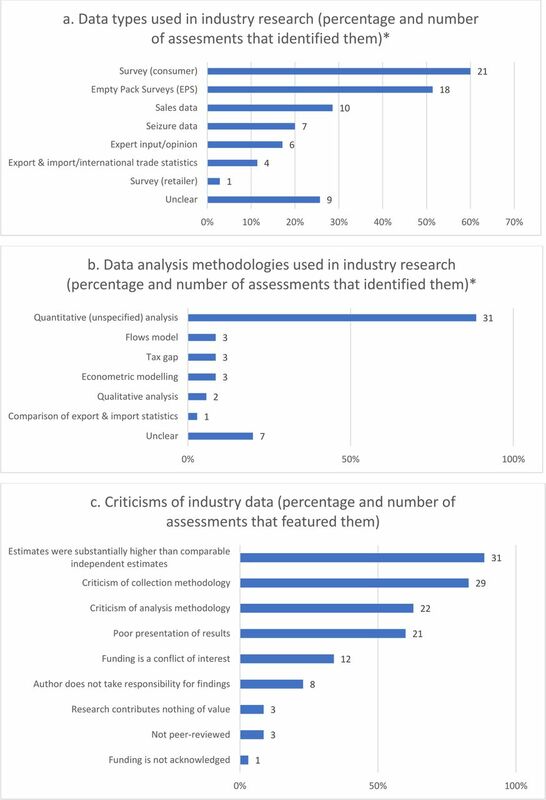 Second, using a framework developed by all authors (see online supplementary appendix 4), we coded five key aspects of the industry data (covering characteristics and criticisms/praise of them (table 1)) as detailed in the 35 assessments. This framework, refined after being piloted on a sample of three assessments, was based on existing literature on methods for measuring ITT3 51–53 and Ross’ criteria54 for assessing the quality of estimates on tobacco tax avoidance and evasion. The critical appraisal and coding processes were recorded in an excel spreadsheet and 100% double-coded, resulting in a mean level of 94% intercoder reliability. All disagreements were documented and fully resolved. As lack of transparency emerged as an over-arching theme within criticisms of industry data, a qualitative overview of transparency-related statements made in assessments (captured using NVivo, a computer software supporting qualitative analyses) was also conducted. Our sample of 35 assessments were all published post-2000. Twenty-five (71%)37 41 44 45 48 55–74 assessed tobacco industry-funded country-level estimates, five (14%)46 47 75–77 assessed region-wide (eg, EU, Asia) estimates and five (14%)1 54 78–80 featured assessments at both regional and country-level. Twenty-one (60%)1 37 41 44–48 54 56 58 59 61 62 64 65 72 73 76 77 80 outlined their methodological approach, 18 (51%)37 41 44–48 56 59 61 64 65 67 72–74 76 77 featured in a peer-reviewed publication and 18 (51%)1 37 41 44–48 54 56 61 62 64 73 74 76 77 79 disclosed their funding source/s. The most commonly featured countries in the literature were Australia (37)1 41 45 54–60 63 65 68–71 78–80 and the UK (9),1 37 41 74 with region-wide data most often relating to the EU (6)1 46 54 76 77 79 and Asia (5)47 54 75 78 80 (table 2). The data type identified most by assessments was survey (consumer) (21), followed by EPS (8) and sales data (10). Data anlaysis was most often identified as quantitative (unspecified) (31) or unclear (7) (tables 3 and 4, figure 2A and B, online supplementary appendix 5). Identified data collection methodologies, analytical methods and criticisms. *Total percentages add up to >100% due to more than one methodology being identified. TTC-funded estimates on ITT were identified as being higher than comparable independent data in 31/351 37 41 44–47 54–63 65–67 69–75 77–80 assessments, although one of these found that industry estimates, while higher in 11 countries than comparable independent estimates, were lower in five other countries.77 Only one assessment identified industry estimates as consistent with independent data.64 TTC-funded ITT estimates varied from 17%80 to 133%–337%75 higher than comparable independent estimates. From assessments that identified discrepancies between industry and independent data, 27 (of 31)1 41 44–47 54–62 65 66 69 70 72–75 77–80 provided explanations for these. These explanations, outlined in sections ’Criticisms of methodological approaches: data collection and analysis', ’Poor presentation of results' and ’Transparency and replicability', were also mentioned in assessments that did not compare industry and independent estimates. The majority of assessments (29/35) criticised industry-funded data collection.1 37 41 44–48 54–58 60–63 65 66 68–71 75–80 The issues identified primarily focused on the data collection method’s (un)suitability for measuring illicit and failure to provide representative samples (table 5). In particular, assessments criticised the use of EPS, which cannot reliably distinguish between illegal (illicit) and legal forms of non-domestic product (table 3), to measure illicit41 45 46 54 60 80 and consumer surveys, due to both potential under-reporting (table 3) and over-reporting of particular types of illicit trade. The main strength of this research is that it is the first attempt to systematically identify and review literature that assesses the quality of industry data on ITT. It has made extensive efforts to identify academic research and grey literature, critically appraised this literature before double-coding it in depth, presented findings and relevant contextual information in an accessible manner and provided an overview of ongoing concerns with TTC-funded data on ITT. However, as only assessments written in English were featured, it is possible that relevant literature in other languages was excluded. Furthermore, the findings of this work are determined by the underlying literature used and may be limited by its accuracy, quality and any potential publication bias. In relation to this last point, while we included all independent assessments (positive or negative), of TTC-funded data it is possible that such assessments focus almost exclusively on data/reports that are problematic. Concerns regarding the representativeness and objectivity of data collection methodologies, errors and mistakes in the data analysis, and poor presentation of results, suggest that the quality of industry data on ITT as a whole is below the expected standard to be considered reliable. Together, all of these problems may help explain the disparity between industry-funded and independent estimates of ITT. Taken together, this indicates that it is how methods are employed and who employs them that dictates the quality of their output. Improving the reliability of estimates on ITT does not therefore mean rejecting available methodologies but ensuring they are used appropriately and transparently. Our findings suggest that industry-funded research has routinely failed to meet these standards. Our findings correspond with the tobacco industry’s long history of manipulating research, including its extensive efforts to undermine and cause confusion on science showing the negative health impacts of smoking85 86 and second-hand smoke,87 and suggest that similar strategies are now being used by TTCs in relation to ITT. Despite overwhelming evidence of the TTCs’ historical complicity in tobacco smuggling,43 88–94 the tobacco industry now portrays itself as key to solving the ITT91 and presents its funding of research on ITT as its attempt to reduce the societal burden of illicit trade and organised crime.49 However, this review’s findings demonstrate that the contribution of tobacco industry-funded data on ITT thus far in aiding understanding of ITT is extremely limited, if not counterproductive. In the meanwhile, existing independent assessments make it clear that TTC-funded data on ITT cannot be trusted. 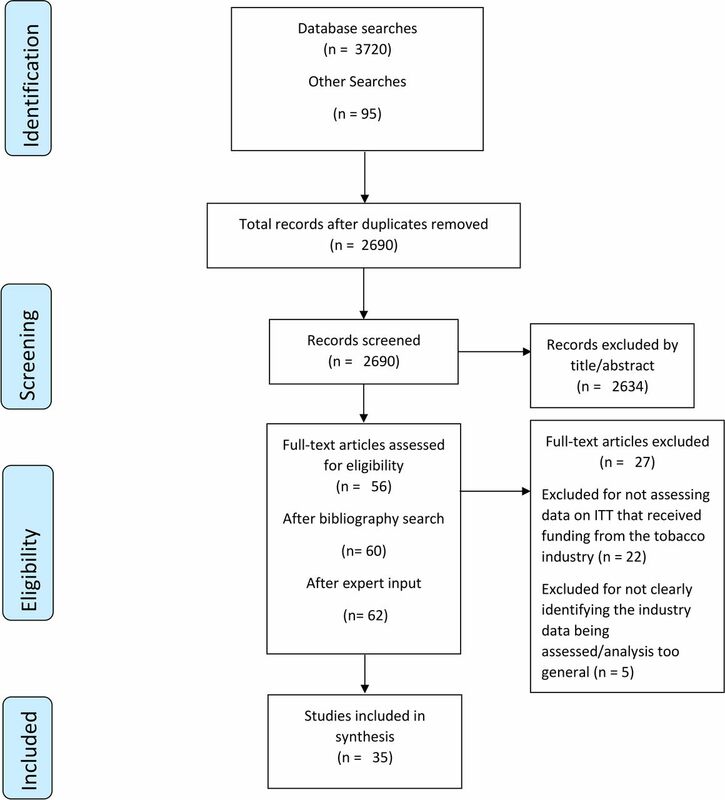 By identifying all of the most common criticisms levelled against industry-funded data on ITT, our findings compliment Ross’ criteria for assessing the quality of estimates on tobacco tax avoidance and evasion54 on ITT and can therefore be used as a framework to assess the quality of future TTC-funded studies on the ITT. It is hoped that this will aid others in determining the quality of future TTC estimates in a sufficiently timely manner to contribute to policy debates. This is the first paper to systematically review assessments of TTC-funded data on the ITT. It finds that TTC-funded data covering multiple world regions routinely exaggerate/overestimate levels of illicit when compared with independent sources and that this is a result of problems at all stages in the research process, with inappropriate usage of methods of data collection and data analysis, misleading presentation of results and a lack of transparency throughout, with information necessary for replication often being excluded. The review concludes that TTC-funded data on ITT cannot be trusted and argues that if the global scale of the ITT is to be better understood, more high-quality and transparent ITT research is needed, and a potential means for providing this would be a tax on tobacco companies, with a portion of raised funds going towards independent development of established methodologies. National Research Council, Institute of Medicine. Understanding the U.S. Illicit Tobacco Market: Characteristics, Policy Context, and Lessons from International Experiences. Washington D.C: The National Academic Press, 2015. World Health Organisation. WHO Report on the Global Tobacco Epidemic: Raising taxes on tobacco, 2015.
. Anti-Contraband Policy Measures: Evidence for Better Practice, 2009. World Health Organisation. IARC. Measures to assess the effectiveness of tobacco taxation . Methods for evaluating tobacco control policies 2008.
. The Micro-Geography of Tax Avoidance: Evidence from littered cigarette packs in Chicago. Am Econ J - Econ Policy 2010;2:61–84.
. Using Littered Pack Data to Estimate Cigarette Tax Avoidance in NYC. National Tax Journal 2007:635–68. Her Majesty’s Revenue and Customs. Measuring Tax Gaps 2010, 2010. Her Majesty’s Revenue and Customs. Measuring Tax Gaps 2011, 2011. Her Majesty’s Revenue and Customs. Measuring Tax Gaps 2012, 2012. Her Majesty’s Revenue and Customs. Tobacco tax gap estimates 2012-13, 2013. Her Majesty’s Revenue and Customs. Measuring Tax Gaps: Tables, 2013.
; Commentary on Joossens, et al . Eliminating the global illicit cigarette trade - what do we really know? Addiction 2010;105:1650–1. KPMG. Project Star 2012: Presentation of results: KPMG LLP. 2013 https://www.asktheeu.org/en/request/2181/response/8322/attach/7/Annex%202%202013%20PMI%20annual%20meeting%20Project%20Star%202012%20presentation.pdf (accessed 06 Nov 2017). KPMG. Project Star - 2011 Results London: KPMG LLP. 2012 https://www.pmi.com/resources/docs/default-source/pmi-sustainability/star-report-2011.pdf?sfvrsn=3f02b0b5_0 (accessed 06 Nov 2017). KPMG. Project Star - 2010 Results. 2011 https://www.pmi.com/resources/docs/default-source/pmi-sustainability/star-report-2010.pdf?sfvrsn=1f02b0b5_0 (accessed 06 Nov 2017). KPMG. Project Sun: A study of the illicit cigarette market in the European Union, Norway and Switzerland: 2014 Results. 2015 http://kpmg.co.uk/creategraphics/2015/06_2015/CRT026736/files/assets/basic-html/index.html#1 (accessed 5 Jan 2017). International Tax and Investment Center, Oxford Economics. Asia-11 Illicit Tobacco Indicator 2012. 2013 https://d1iydh3qrygeij.cloudfront.net/Media/Default/landing-pages/asia11/report-asia11-2013.pdf (accessed 07 Nov 2017). International Tax and Investment Center, Oxford Economics. Asia-16 Illicit Tobacco Indicator 2014. 2015 https://d2rpq8wtqka5kg.cloudfront.net/328658/open20160310031300.pdf?Expires=1510161385&Signature=bst9mOsGcEI4sfT9uG8J40wuCKXwMnkzeaZk8WUm8hW5KV2h8lP6Hcy9ZEYAvKJisjG4eEDNJiW8vqfWgD242WJHRB4vqL4tf9cvThAGiWCaj5TCNUKd1u7IyS6ConmD91LC9q4dI45RgrAi8e0SZQG4FhLkWDhHzs02mUNgXrEDgM0eyB0FUw9xyE7lE-hOQGxI8BSkmFF9jeDD-pHN692ERlEqxPSG55sGdmfcVG0oRMNnHpLL2XSJmqM0UWLW05nW5kloEDPSVCc7VqqZVzL2ZQ2V4ny6rLqLNiqaNd~tSFxMhoD5BXzbzGzmSwyX4ZnCuRwzP4MIdZ6ZyioCpg__&Key-Pair-Id=APKAJVGCNMR6FQV6VYIA (accessed 07 Nov 2017). International Tax and Investment Center, Oxford Economics. Asia-14 Illicit Tobacco Indicator 2013. 2014 https://d2rpq8wtqka5kg.cloudfront.net/276505/open20140926040700.pdf?Expires=1510158660&Signature=HLFLIIcwzk8Nfa8wVA8bHRIU-PH~nobEklUf0JoCbT6p3xZqqCY7-nSqTaUQ6rePrtRS6xTqwHNiimcLnd7vLDW6332HRZjGcC-iTf5xHtcdPr-VkJRKnni9cD~yGXMFtk1fL5VOiP4GIVd9IRQfiVvm90LD9h8qj8jJlPwfWcfYKZiZmPT6r8ELdJ3c5jizUONjcxvgSqYYnEBEU6VKJw~c2e3~rqp0hzzj~DCTwdVfdFB07lfDUU-b8MerC9UYip5RM1AfqAKOnnNWK-blXaycO9SivnRUGSHtwLDpOYV~m7t2s~ZkO7ad3N6JFsEwEbneER-bemRNaDOgBOglwQ__&Key-Pair-Id=APKAJVGCNMR6FQV6VYIA (accessed 07 Nov 2017). Deloitte. Illicit trade of tobacco in Australia. A report prepared for British American Tobacco Australia Limited, Philip Morris Limited and Imperial Tobacco Australia Limited. 2011 http://www.webcitation.org/69THNRS81 (accessed 06 Nov 2017). KPMG. Illicit tobacco in Australia: 2014 full year report. 2015 http://www.webcitation.org/6mv3eTWBV (accessed 21 Dec 2016). KPMG. Illicit tobacco in Australia: 2013 full year report. 2014 http://www.webcitation.org/6mv3yrKLs (accessed 21 Dec 2016). PriceWaterhouseCoopers. Australia’s illegal tobacco market - counting the cost of Australia’s black market. 2010 http://www.tobaccotactics.org/images/0/09/100201_-_Price_Waterhouse_Cooper%27s_-_pwc_report.pdf (accessed 06 Nov 2017). Deloitte. Illicit trade of tobacco in Australia, 2011. KPMG. Project Star 2012 Results, 2013. KPMG. Project Star 2010 Results, 2011. KPMG. Project SUN: A study of the illicit cigarette market in the European Union, Norway and Switzerland, 2016.
International Tax and Investment Center, Oxford Economics. Asia-11 Illicit Tobacco Indicator 2012, 2013.
International Tax and Investment Center, Oxford Economics. Asia-16 Illicit Tobacco Indicator 2014, 2016.
International Tax and Investment Center, Oxford Economics. Asia-14 Illicit Tobacco Indicator 2013, 2014.
. KPMG Response to Criticisms of its ’Illicit Tobacco in Australia Report' in the Chantler Review, 2014.
. Tobacco tax structure and smuggling. FinanzArchiv 2009;65:93–104.
. Complicity in contraband: British American Tobacco and cigarette smuggling in Asia. Tob Control 2004;13:104–11.
. Towards a greater understanding of the illicit tobacco trade in Europe: a review of the PMI funded ’Project Star' report. Tob Control 2014;23:E51–E61. Philip Morris International. ABOUT PMI IMPACT. http://www.pmi-impact.com/Explore/About (accessed 25 Sep 2017). Tobacco Control Research Group. PMI IMPACT: TobaccoTactics.org: University of Bath, 2017.
. Understand, Measure, and Combat Tobacco Smuggling. In: Yurekli A , de Beyer J , eds. Economics of tobacco toolkit.. Washington, DC: World Bank, 2002. National Cancer Institute WHO. The Economics of Tobacco and Tobacco Control, 2016. IARC. IARC Handbooks of Cancer Prevention: Tobacco Control. Effectiveness of Price and Tax Policies for Control of Tobacco. Volume 14, 2011.
. Understanding and measuring cigarette tax avoidance and evasion: a methodological guide, 2015. Cancer Council Victoria. Illicit trade of tobacco in Australia. A report prepared by Deloitte for British American Tobacco Australia Limited, Philip Morris Limited and Imperial Tobacco Australia Limited: A critique prepared by Quit Victoria, 2012. Quit Victoria, Cancer Council Victoria. Illicit trade of tobacco in Australia. A report prepared by Deloitte for British American Tobacco Australia Limited, Philip Morris Limited and Imperial Tobacco Australia Limited. A critque prepared by Quit Victoria, Cancer Council Victoria. 2011 http://www.cancervic.org.au/downloads/mini_sites/Plain-facts/CommtsDeloitte18.11.11.pdf (accessed 06 Nov 2017). Cancer Council Victoria. Plain packaging of tobacco products: a review of the evidence, 2011.
. Will plain packaging reduce cigarette consumption? Economic Papers: A journal of applied economics and policy 2012;31:303–17.
. Removing the emperor’s clothes: Australia and tobacco plain packaging, 2014.
. The Market for Legal and Illegal Cigarettes in Poland: A Closer Look at Demand and Supply-Side Characteristics. 2007 https://assets.publishing.service.gov.uk/media/57a08c0c40f0b64974000f72/Grant_223_Smuggling_in_PL_Manuscrip.pdf (accessed 07 Jan 2018). Cancer Council Victoria. Comments on survey of Australian retailers views about plain packaging. http://www.cancervic.org.au/downloads/plainfacts/CCV_Critique_PMLSurvey280714.pdf (accessed 06 Nov 2017). Action on Smoking and Health. Illicit tobacco: monitoring and mitigating risk in New Zealand 2010. Nzier. Review of Ernst & Young’s Report on New Zealand’s illicit Tobacco Market: A Report for ASH New Zealand, 2010. Cancer Council Victoria. Analysis of KPMG LLP report on use of illicit tobacco in Australia: 2013 Half Year Report, 2014. Cancer Council Victoria. How big a problem is illicit tobacco and has it increased since the introduction of plain packaging in Australia- a critique of the KPMG October 2014 half-year report on illicit tobacco in Australia and complilation of data from ACBPS seizures and data from survey of smokers and retail audits. 2014 http://www.cancervic.org.au/downloads/plainfacts/Nov14critique_of_KPMG13Oct2014_HlfYr_0215.pdf (accessed 06 Nov 2017). Cancer Council Victoria. Analysis of KPMG LLP. Illicit tobacco in Australia: 2014 Full Year Report. 2015:30. Cancer Council Victoria. Analysis of KPMG LLP report on use of illicit tobacco in Australia 2013 Full year report. 2014 http://www.cancervic.org.au/downloads/mini_sites/Plain-facts/analysis-kpmg-llp-report-illicit-tobacco-aust-2013.pdf (accessed 06 Nov 2017).
. A mountain or a molehill: Is the illicit trade in cigarettes undermining tobacco control policy in South Africa? Trends in Organized Crime 2010;13:299–315.
. Illicit trade, tobacco industry-funded studies and policy influence in the EU and UK. Tobacco Control 2014;23:81–3. South East Asia Tobacco Control Alliance. Failed: A Critique of the ITIC/OE Asia-14 Illicit Tobacco Indicator 2013. 2015 https://seatca.org/dmdocuments/Asia%2014%20Critique_Final_20May2015.pdf (accessed 07 Nov 2017). Cancer Council Victoria. Questions and answers on plain packaging in Australia, Facts sheet no. 3: What has happened to use of illicit tobacco since the introduction of legislation to standardise the packaging of tobacco products in Australia?.
. Tobacco in Australia: Facts and issues. 4th ed. Melbourne: Cancer Council Victoria, 2012. South East Asia Tobacco Control Alliance. Asia-11 Illicit Tobacco Indicator 2012. More myth than fact. A critque by SEATCA. 2014 http://seatca.org/dmdocuments/ITIC%20report_More%20Myth%20than%20Fact_2%20July%202014.pdf (accessed 01 Oct 2014).
. A new method for estimating the illicit cigarette market at the subnational level and its application to Italy. Criminal Markets and Mafia Proceeds 2016:51–76. Quit Victoria, Cancer Council Victoria. Illicit trade of tobacco in Australia. A report prepared by Deloitte for British American Tobacco Australia Limited, Philip Morris Limited and Imperial Tobacco Australia Limited: A critique prepared by Quit Victoria. 2012 http://www.cancervic.org.au/downloads/plainfacts/CritiqueDeloitte_May_2012_Update_.pdf (accessed 06 Nov 2017).
. Global trends and projections for tobacco use, 1990–2025: an analysis of smoking indicators from the WHO Comprehensive Information Systems for Tobacco Control. The Lancet;385:966–76. Japan Tobacco International. The billion pound drop - The impact of tobacco smuggling and cross-border shopping in the UK, 2012.
. Doubt is their product: How industry’s assault onscience threatens your health. Oxford University Press: Oxford, 2008.
. "Key to the future": British American tobacco and cigarette smuggling in China. Plos Medicine 2006;3:1080–9. The International Consortium of Investigative Journalists. Global Reach of Tobacco Company’s Involvement in Cigarette Smuggling Exposed in Company Papers Washington. https://www.icij.org/investigations/big-tobacco-smuggling/global-reach-tobacco-companys-involvement-cigarette-smuggling-exposed-company-papers/ (accessed 06 Nov 2017). KPMG. Illicit tobacco in Australia 2016. 2017 https://home.kpmg.com/uk/en/home/insights/2017/04/illicit-tobacco-in-australia-2016.html (accessed 20 Dec 2017). KPMG, Royal United Services Institute. Project Sun: A Study of the Illicit Cigarette Market in the European Union, Norway and Switzerland. 2017 https://rusi.org/publication/other-publications/project-sun-study-illicit-cigarette-market-european-union-norway-and (accessed 20 Dec 2017). KPMG. Illicit cigarette trade in the Maghreb region. 2017 https://home.kpmg.com/uk/en/home/insights/2017/07/illicit-cigarette-trade-in-the-maghreb-region.html (accessed 20 Dec 2017).
. Tobacco Retailers’ Alliance reveals likely impact of second tobacco tax rise. 2017 https://www.talkingretail.com/news/industry-news/tra-survey-reveals-likely-impact-second-tobacco-tax-rise-08-11-2017/ (accessed 20 Dec 2017).
. Cigarette contraband still at worringly high levels in Romania- South-East region sees most intense trafficking. 2017 http://www.business-review.eu/news/cigarette-contraband-still-at-worryingly-high-levels-in-romania-south-east-region-sees-most-intense-trafficking-154419 (accessed 20 Dec 2017).
. 1 Out of 8 Cigarettes in Morocco is Illicit. mostly Smuggled from Algeria 2017;23 https://www.moroccoworldnews.com/2017/10/231968/cigarettes-morocco-algeria-tobacco/. Foundation for a Smoke-Free World: Our Vision. 2018 https://web.archive.org/web/20180530103319/https://www.smokefreeworld.org/our-vision (accessed 27 Mar 2018). Tobacco Control Research Group. Foundation for a Smoke-Free World. TobaccoTactics.org: University of Bath, 2018. Tobacco Control Research Group. British American Tobacco: TobaccoTactics.org: University of Bath, 2017. Tobacco Control Research Group. Imperial Tobacco: TobaccoTactics.org: University of Bath, 2017. Tobacco Control Research Group. Japan Tobacco International. TobaccoTactics.org: University of Bath, 2017. Tobacco Control Research Group. Philip Morris: TobaccoTactics.org: University of Bath, 2017. Quit Victoria, Cancer Council Victoria. Analysis of KPMG LLP report on use of illict tobacco in Australia, 2013. Tobacco Control Research Group. Alliance of Australian Retailers. TobaccoTactics.org: University of Bath, 2018. Altria. 2017 Recipients of of Charitable Contributions from the Altria Family of Companies. 2017 http://www.altria.com/Responsibility/Investing-In-Communities/Documents/GranteesList.pdf (accessed 10 Apr 2018). European Commission. Cooperation Agreement between British American Tobacco (Holdings) Limited and The European Union as represented by the European Commission and The Signatory Member States of the European Union. 2010 https://ec.europa.eu/anti-fraud/sites/antifraud/files/docs/body/bat_main_agreement.pdf (accessed 25 Sep 2017). European Commission. Co-operation Agreement dated as of 27 September 2010 among Imperial Tobacco Limited and The European Union Represented by the European Commission and Each Member State Listed on the Signature Pages Hereto. 2010 https://ec.europa.eu/anti-fraud/investigations/eu-revenue/imperial_tobacco_en (accessed 25 Sep 2017). European Commission. JT International S.A. JT International Holding BV and the European Community and the Participating Member States - Cooperation Agreement. 2007 https://ec.europa.eu/anti-fraud/sites/antifraud/files/docs/body/cooperation_agreement.pdf (accessed 25 Sep 2017). European Commission. Anti-contraband and anti-counterfeit agreement and general release dated as of July 9, 2004 among Philip Morris International Inc., Philip Morris Products Inc., Philip Morris Duty Free Inc., and Philip Morris World Trade SARL, The European Community Represented by the European Commission and Each Member State Lised on the Signature Pages Hereto. 2004 https://ec.europa.eu/anti-fraud/sites/antifraud/files/docs/body/agreement_2004.pdf (accessed 25 Sep 2017). Her Majesty’s Revenue & Customs. Measuring tax gaps 2016 edition: Tobacco tax gap estimates for 2015-16, 2016. Research for International Tobacco Control, IDRC. Qualitative research for tobacco control: a how-to introductory manual for researchers and development practitioners. 2005 https://prd-idrc.azureedge.net/sites/default/files/openebooks/074-8/#page_31 (accessed 08 Dec 2017). Contributors ABG conceived the idea for the study and all authors participated in its design (eg, inclusion criteria, coding framework). AWAG collected data; AWAG, KAE-R and JLH coded data, and all authors contributed to data analysis. AWAG and KAE-R produced first draft and all authors edited. Funding This work is supported by CRUK grant no. C50816/A25745. KAE-R and ABG (grant number C27260/A20488) and JLH (grant number C58487/A22731) are supported by Cancer Research UK ww.cancerresearchuk.org. AWAG, KAE-R, JLH and ABG are part of the UK Centre for Tobacco and Alcohol Studies (grant no. MR/K023195/1), a UKCRC Public Health Research Centre of Excellence. Disclaimer The opinions expressed are those of the authors alone.